Look, I’m all for giving women a shot in traditionally male-focused franchises, but when all it boils down to is an application of “Rule 63,” then I don’t think we’re doing these women justice. In this remake/reboot, the visuals and weapons get an upgrade, and that’s about it. If they truly wanted to make a “Ghostbusters with women,” then the characters shouldn’t have been so interchangeable with the originals. I understand the need to maintain the parallels to the original, but these characters come off more like men in women’s bodies than women who have their own, unique challenges and approaches to solving problems. If anything, Ghostbusters (2016) shows how extraordinary the comedy and special effects of the original Ghostbusters (1984) were. While the original usually earned its laughs with a wink, this remake had jokes that mostly relied upon awkward and uncomfortable situations or faux pas. I get that sometimes the improvisational nature of comedy can work for people who got their start on Saturday Night Live (as 3/4 of the cast has). But when it seems like the camera was left on to capture random moments/outtakes/bloopers that made it into the final movie, the 4th wall is broken, and the illusion of the film fails. Despite all this, the movie itself is mostly entertaining. Even if it heavily borrowed from the original, then it still meant you were watching the original in some form. And the original was entertaining. Some of the plot points were tightened up a bit, and the city of New York felt more like a character than a backdrop, both of which I appreciated. The cameos from the original cast were fun but mostly unnecessary. I can only hope that the sequel (if it is ever made at all) does a better job of taking its women seriously. 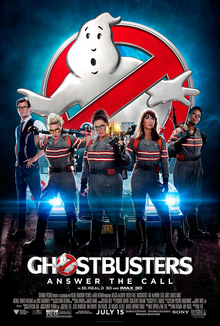 An interchangeable and weaker “Rule 63” version of the original, I give Ghostbusters 2.5 stars out of 5.